The mission of the Flood Warning and Floodplain Management programs is to reduce risk to life and property by assisting local flood control and floodplain management efforts. The Flood Warning Program coordinates with local communities, state and federal agencies for the planning, design, construction and operation of flood warning systems. The program also operates and maintains field equipment and hosts the statewide flood warning website. The Floodplain Management Program coordinates the National Flood Insurance Program (NFIP) in Arizona, assists local communities participating in the NFIP through the implementation of the federally-funded Community Assistance and Cooperating Technical Partners programs, and publishes state criteria for floodplain management at the local level. The National Flood Insurance Program (NFIP) was created by Congress in 1968 through the National Flood Insurance Act of 1968 (P.L. 90-448). The NFIP is administered by FEMA and the Arizona Department of Water Resources is the state coordinating agency. The NFIP allows property owners in participating communities to purchase government-sponsored and regulated flood insurance. When local communities voluntarily join and participate in the NFIP, they agree to adopt and enforce a floodplain management ordinance to reduce future flood risks in Special Flood Hazard Areas (SFHA). The federal government, in turn, makes flood insurance available to property owners within the community as a financial protection against flood losses. The SFHAs and other risk premium zones applicable to each participating community are depicted on Flood Insurance Rate Maps (FIRMs). In 1977, Governor Castro signed Executive Order No. 77-6 for Floodplain Management that documented the intent of the State of Arizona to comply with the floodplain management provisions contained in the National Flood Insurance Program (NFIP). Today, statutory authorities for the Floodplain Management Program activities are found in Arizona Revised Statutes (A.R.S.) Chapter 21, Article 1, County Flood Control Districts, §48-3601 to 48-3628. For more information, please visit the links on the right side of this page. Even before ADWR came into being, the Arizona Legislature in 1979 created the Arizona Flood Warning Office, motivated by statewide flooding events in 1978. 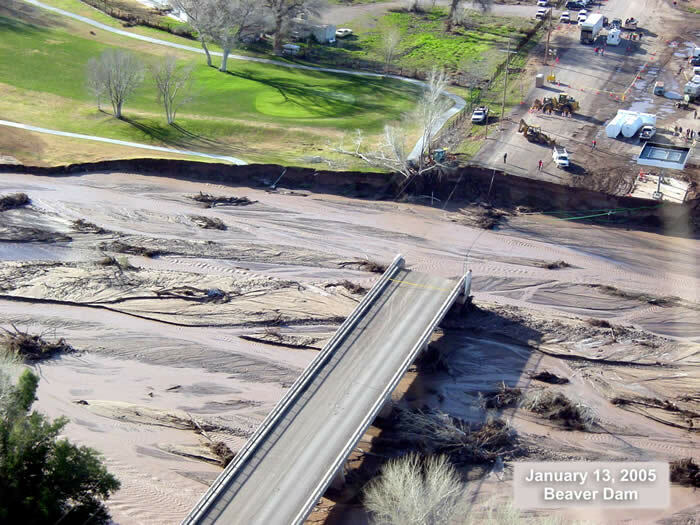 A fund was established and used to support the Arizona offices of the US Geological Survey (USGS) in maintaining their streamflow gauges, and the National Weather Service (NWS) to improve flood prediction. ADWR’s role expanded in 1994 when the Legislature adopted Article 6, Flood Warning Systems, §45-1501 to 45-1506. This action was in response to serious, widespread flooding in 1993 when it became apparent that the State could benefit significantly from improved communication between government entities. The AFWS website is a tool that is used to enhance communication. Currently, ADWR is the lead State agency involved in the Arizona Flood Warning System (AFWS). The AFWS is comprised of local, state and federal entities that collaborate on statewide strategies for flood management. AFWS disseminates real-time hydro-meteorological data and products for emergency managers, floodplain administrators, weather forecasters and the public. ADWR co-chairs the AFWS Multi-Agency Task Force (MATF) workgroup. The primary goal of the MATF is to enhance communication between entities that own and operate their own flood prediction systems.